Calling all talented visitors to the Festival! For the very first time, we’re running a costume competition! Open to all paying visitors to the Festival (sorry re-enactors and volunteers), this is a chance to show off your skills with a needle and thread. We’ve been so impressed by the effort that is put into the clothing worn by our visitors that we’re giving you a chance to show them off! We are looking for dressmakers and enthusiasts to showcase their talents in recreating garments from the 600 – 1600 era, so if your costume is well researched and you believe it would qualify as an authentic garment we could see in medieval manuscripts, we think you should apply now! The competition will be taking place on both the Saturday and Sunday, between 12.30pm and 1.15pm, on the stage next to the Friar’s Folly Tavern. Applications will only be accepted by filling out the Entry form on the website. Must be over 16 years of age (entrants between 16-18 must have written parental consent to be eligible) Consent form can be found here. All applications will be reviewed to determine eligibility; each eligible entrant will be contacted via email directly by the Festival to discuss participation. The judging panel will determine first and second place on each day and the audience will pick a ‘People’s Choice’. Please read the Terms and Conditions and our Frequently Asked Questions for further information or contact us at performance@abbeytournament.com with any questions you may have. The countdown is on for the Festival, time to get out the fabric and thread and create something amazing! Is that a real fire/baby/dog/sword? Absolutely, so please be careful. Can I go into your tent? If it’s open, please do. However, if it is closed, it is a private space. Re-enactors encampments are their homes for the weekend, so please respect their privacy. Can I eat your food? 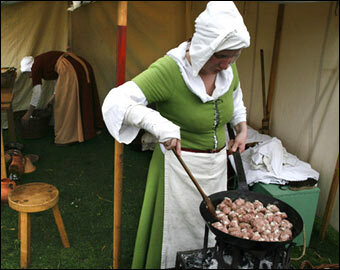 Due to food safety guidelines, re-enactors can’t let you share their meals. But they will be happy to give you the recipe so you can try it at home. Can I take a shortcut through your encampment? The ropes that keep the tents upright can be a trip hazard, so please walk around the encampments, not through. Feel free to chat to the re-enactors, they’re passionate about what they do and love to share! Please also be mindful of their possessions and space, they’ve worked very hard to create everything that you see. Heroes of the Abbey Medieval Tournament! Applications for the 2014 Heroes of the Abbey Festival Trading Cards are now closed. For more information please feel free to contact Joshua Stanfield at: joshua.d.stanfield@gmail.com. It means each and everyone one of our followers are starting to get excited about what this year is going to bring! If you have been following the blog posts you would have already heard about the Medieval Carnivale. You would already know that Abbeystowe is putting on a Medieval Carnivale with “Horse Vaulting and Acrobats“, “Colourful Costumes and Dancing”, “Merry Medieval Music“, a “Dragon Fire Twirling Show” and of course The Carnivale will feature the real stars of the show… YOU! All ticket holders will be invited to enter the arena for the last half hour of the show to dance and join in on the merriment. The wonderful wandering performers at the Carnivale! But just when you think you know all about The Medieval Carnivale, this final blog post is letting you in on a few more secrets… The gorgeous stilt walkers from Fire Phoenix Tribe will be at the Carnivale in a stunning costume, new to the Abbey Medieval Festival! Be sure to see the strikingly tall characters as they wander around the Carnivale for all to admire. Join in on the surprise and come dressed in your own costume or mask! 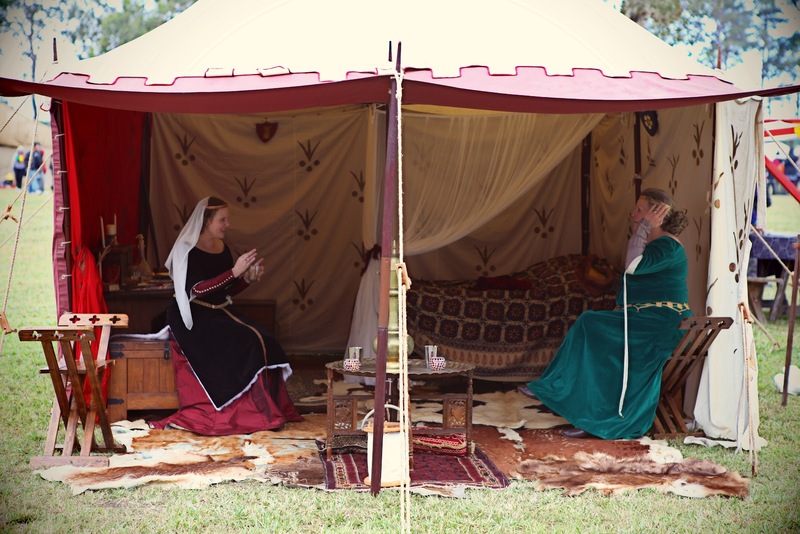 We would love to see you dressed in your own Medieval Costume. The Carnivale Night will welcome all folk who wish to see how to celebrate in fabulous Medieval Fashion! The cheerful folk from All Star Fish will delight the early bird crowd with their mischief and tomfoolery, be sure to keep an eye out for your favourite Medieval Street Performer! Be prepared for a Carnivale, get your tickets before they are sold out! If you are as excited as we all are about the Medieval Carnivale then you should be getting there at 5pm to make sure you have time to visit Friar’s Folly Tavern who will be operating from the Jousting Arena especially for this event! Be amused and delighted by the comical Lord Herald, Sir. Blair! This event will sell out. The grandstand will be filled so don’t miss out on your tickets. What happens after an exciting day of jousting and sword fights have come to an end at The Abbey Tournament? After the Medieval Knights dismount their noble steeds and take off the heavy Steel Armour. The sun is almost gone as the horses are unsaddled and groomed. The horses look to each other and are feeling good in the cool air…. Will there be one last chance for the horses to show off? One last opportunity to kick up their hooves before it is time to retire to the warm stables? See Horse Tricks and Vaulting at The Medieval Carnivale! The Medieval Carnivale is the only night time event that will flaunt the extraordinary talents of trick horses and riders in a show that will have your eyes in disbelief. See riders vaulting on to moving horses and display extraordinary skills of balance and strength in an elaborate Medieval Carnivale style show. A Medieval Knight would practice jumping onto horses from the ground and rehearse other elegant exercises to improve their battle edge. Horses would be trained to fight with the knight in battle without the use of reigns to guide them… The Carnivale will blitz the art of Vaulting and riding horses without reigns beyond the Medieval Battle Field and into an unforgettable show of cantering horses and acrobatics. Don’t miss out on the debut of The Medieval Carnivale! The first Medieval Carnivale will be held on Saturday night, gates are opening at 5pm for a 5.30pm start. Come and enjoy a cider or ale before the show or grab your seat and be entertained by our special early bird performers. Our notorious Street Performers will be roaming around before the show and you will see giant stilt walkers in their special Medieval Carnivale themed costumes. This event will have something for everyone, young and old and in between. The Medieval Carnivale tickets are on sale now, you won’t want to miss this magnificent show! Next Tuesday read about the Music and Dancing that will delight your ears and have your feet tapping at The Medieval Carnivale! Birds of Prey and Knights go together don’t they? The medieval knight of popular media is usually dressed in shining armour, upon a fiery steed, jousting and riding off into war and gallant adventure or committing wicked atrocities to the defenceless common folk but not often is he pictured with a hawk on his glove. Yet this was more common than the knight in shining armour. Birds of prey were an important part of medieval aristocratic life and both lords and ladies often went about their daily duties with a hawk or falcon within arms reach. These birds played an important role in a triumvirate of animals which also included horses and hounds. Primarily used for hunting, these birds were used as a fashion statement as well as a functioning part of the noble household’s food supply. Birds of prey were very special to the noble class of medieval Europe. These birds were treated very well, housed, kept, groomed, fed and handled on a daily basis. Some nobles kept their favourite bird with them at all times; by their bed, in church, at tournaments or at feasts and formal occasions. They were not just enamoured of their ability to hunt, their majestic, proud appearance or aesthetically pleasing design but also of their place in the natural world. Raptors soared above the ground free of terrestrial restraints coming to ground only when to suit their own purpose or when wounded or killed. To the mind of the battle born warrior these birds were their idealistic equal, a mirror image of themselves among the common folks. Something else they felt was parallel between themselves and birds of prey was that they were unequalled in the art of slaying. That is to say, in the natural world the raptor was greatly feared and respected by other animals, birds and land dwelling prey who understood that a conflict with these creatures would lead to wounding or death, temporary escape if you were lucky. I was observing three crows, scavenging a space for food when suddenly without warning a small bird, what looked to me a pigeon, fell from the sky, a lifeless mass.The three crows immediately moved to set upon this bird and just as suddenly, with an elegance and grace that spoke of its skill and power, a falcon landed on top of the bird and mantled it, spreading it’s wings over it’s prey and adopting a threatening posture to challenge and ready to defend that which it considered to be rightfully its own. The pigeon was obviously its kill and as soon as it made eye contact with the three crows, all three scattered to give the falcon space and seeing that none dared intrude on its authority, took to the sky again with its prey. The crows did not for one second dare to rise to the falcons challenge; they understood their place in the natural order of things. This too is how the medieval noble viewed himself among his social inferiors; dominant and unquestionable, through his social position, and his skill as a warrior. Birds of prey can be found in medieval manuscripts, carvings, sculpture, paintings and heraldic achievements such as shields, badges and crests. Take for example the heraldry of Sir Justyn Webbe, fictional knight of the 14thC who uses his legitimate family arms today. Upon his shield he bears four peregrine falcons which denote swiftness and loyalty, their gold colour (represented by yellow) denotes faith and obedience. The falcon was also seen by the church as a symbol of true conversion from pagan beliefs. King Edward III of 14thC England favoured the use of a falcon as one of his primary badges of livery and favour. So as you might deduce, the falcon used as a heraldic device can tell a lot about a man’s character and history. In the Middle Ages hunting with birds of prey was divided into two groups based on the type of bird being used. Falconry was the art of flying falcons to hunt for game and hawking was the same art when using hawks or eagles. A falconer was the name given one who engaged in falconry and an austringer was the name of one who went hawking. Owls were not used at all and rarely kept because of superstition associated with them . The often-quoted Book of St Albans or Boke of St Albans 1486, has a list of birds and who may fly them as according to social rank. It has been dismissed by many historians as being idealistic at best. Indeed there is much evidence from the Middle Ages to suggest that the proposed list of birds restricted by social rank never existed or was enforced at all. Authors note: The art of falconry, that is hunting game with birds of prey, is illegal in Australia. The author does not participate or endorse this illegal activity within Australia. The birds of prey used by Sir Justyn are from Full Flight Conservation Centre and are flown not to hunt but for rehabilitation and educational purposes. A big hello and welcome back all! In my last blog post, I wrote about how technology has the ability to invaluably connect and reconnect us with our friends and family. On another occasion, I wrote about other technology used for the festival this year; the Big Scan and our Interstate Competition. Technology and gadgets have been around for a long time, man has always been coming up with inventions to make his life easier. This is as true in the medieval era as it is today, and nome more so than today! Technology is giving the festival a whole new exciting dimension, and giving our visitors even more to experience. And this week, when I queried the urgent communications to-ing and fro-ing across the office, the explanation I got was ‘the festival App ‘. Again technology! So being someone who is constantly in awe of technology, I can’t resist delving a little deeper into our new and amazing iPhone App. For those of us who live quietly and happily, oblivious to i-technology, the app (or application) is a software programme which can be downloaded onto an iphone (or android) mobile phone, allowing us to have instant and relevant information about the festival at our fingertips , literally. Yes, it’s indulging the inner geek in us all, even those of us that are normally not really ‘geeky’. So if it’s not for you, that’s ok. But just this once, I want to engage our ‘Teckies’! For those of us who simply can’t live without a iphone; if from the moment you wake, to way past bed time, you’re on Facebook, Twitter, online banking, online shopping, e-bay, amazon, online anything possible, well this is for you! We give you the Abbey Medieval Festival App! Features of app? Briefly…..programme of events, map of the festival, news updates, information on the exhibitors. Biggest and best’est’ feature? …….Customisation! I know you’ll like this. Whatever festival programmes you want to attend, the app will give you the information you need; the location, the time, the duration, whatever you need to know while you are on the move! And exhibitors – you’re going to love it too! Push notifications! You know those little texts telling people that there’s only twenty more toffee apples left or the jousting is running late because of a Knight getting stuck in his armour, or our VIP’s have arrived, whatever you need to tell people; the App’s got it covered. And for visitors sticking around our wonderful corner of the world for a little while after the festival is over, we have included information on some of the other great things to see and do around our region. The festival App will be freely available through the Iphone and Android App Stores at the end of this month. The Big App is here to stay…..and besides….it’s cool……… it’s another experience from the Abbey Medieval Festival that we know you’ll love……and we already know how even-cooler it’s going to be next year! So what happens when the sun goes down on a medieval day full of markets, after picking up that great new wooden food bowl that has been carved so beautifully, and all the furs and loom-woven pieces and the excitement of the tourney with its elaborate jousts and battles ? The horses are groomed and fed after a day of jousting. And the cannons are hushed. Do the inhabitants sleep? Oh noooo nooo nooo! The visitors have donned their best gear – dresses swishing, cloaks swirling, children delightedly whisper to each other – ‘the fire twirlers are here with the Burning Dragon!”! Feet are tapping with the last strains of drums and strings still hanging in the air. Our tummies already happily filled from the day’s feasting, and we can settle down on our benches and await with pleasure the scenes to come. What happens at a Medieval Carnivale? What do battle hardened horses do at night to play? How do the riders of war trained horses wind down after a day of action? A gypsy tribe is settling down for the night, something is in the air… What is stirring away from the encampment that calls for a celebration? The stars are twinkling, the performers’ blazing sticks are twirling seemingly magically – intertwining with dangerous dragon! The rhythm, the beat and the tempo of a time where the music reflected a community’s way of life. Next Tuesday’s post will be the first of a series highlighting the spectacle of our professional Medieval Carnivale Entertainment Team who will delight you for two hours! We trust you’ve got your tickets to the Festival! 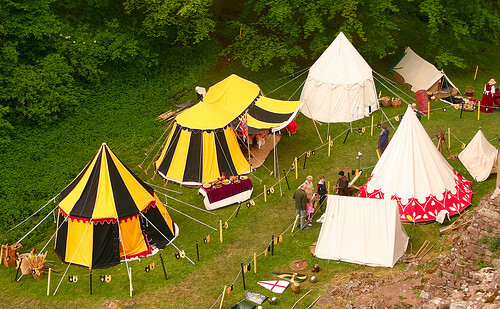 Your experience …….we take it seriously at the Abbey Medieval Festival. Today, an up-to-the-minute QR-code-scanning experience via a print ad in the national newspapers. Cutting edge technology, perhaps! In July, join the medieval transformation, where your sword displays the cutting edge!